"Sampath Speaking" - the thoughts of an Insurer from Thiruvallikkeni: T20 WC at Bangla - new coaching manual - bowl to mannequins.. !! 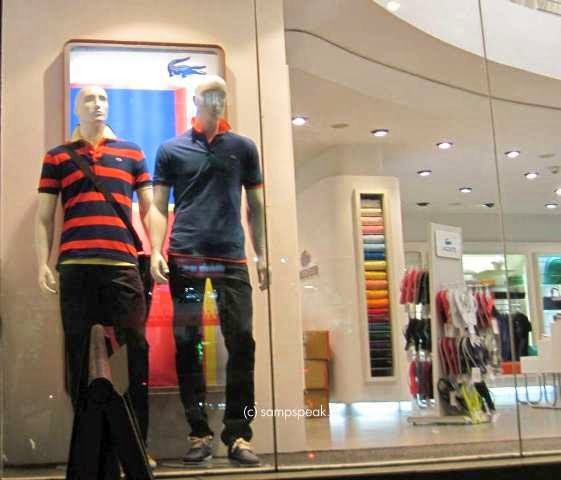 T20 WC at Bangla - new coaching manual - bowl to mannequins.. !! How do coaches inspire and improve performance ? A mannequin (also called a manikin, dummy, lay figure or dress form) is an often articulated doll used by artists, tailors, dressmakers, window-dressers and others especially to display or fit clothing. Mannequin comes from the French word mannequin, which had acquired the meaning "an artist's jointed model" ~ wonder what is the Cricket connection ? The T20 WC has begun……… it features 16 teams including all ten full members and six associate members who qualified through the 2013 ICC World Twenty20 Qualifier. There are to be Group matches; Super 10; Semis and finals….. Ireland, Netherlands, UAE and Zimbabwe are fighting out for that elusive 1 place; while in Group A : it is Nepal; Bangladesh; Afganistan and Hongkong. Yesterday in the 2nd match, Hongkong won the toss and decided to bowl……. Nepal made 149 losing 8 and chasing Hong Kong were all out for paltry 69. Both teams were making their debuts at a global competition, having qualified for this expanded World T20. Thought there were Nepal fans, the 18,000-capacity stadium was sparsely populated. Earlier, in the 1st match, Bangladesh made short work of Afghan who were bundled out for 72… Bangla raced to a victory by 9 wickets avoiding the ignominy of losing to them again. It all started so badly for Afghan with a loss of wicket of the 1st delivery. Elsewhere Sri Lanka is plagued by player-board stand off – the board had even threatened to send a second-string team, yet it is stated that top players have not signed their contract. SLC stands to gain most from its cricketers playing in the tournament unsigned. The board is no longer bound to pay the $500,000 flat fee, nor the two-tiered incentive payments it had offered as part of its revised offer, which was a partial sop to the players' demand for 20% of the gross sum received by SLC for tournament participation. The players' grievances are fuelled by the complaint that they are being penalised for the administrators' misuse of finances. The board had run up debts of almost $70 million when they built two new stadia and renovated a third for the 2011 World Cup…….. and Kumar Sangakkara has announced he will retire from Twenty20 internationals following the World T20 in Bangladesh. Sangakkara, 36, has played 50 T20Is for Sri Lanka, hitting 1311 runs at an average of 32.77 and a strike rate of 120. A patient, accumulative batsman for much of his career, Sangakkara has been a considerably improved limited-overs batsman over the past 18 months. Though a more belligerent outlook has paid most obvious dividends in ODIs, he has also contributed heavily to Sri Lanka's consistency in T20s. Sangakkara captained his team to the final of the 2009 World Twenty20, and had also been integral to Sri Lanka's charge to the 2012 final - both of which were lost. He led them in ODI Worldcup 2011 too – remember the toss controversy !!! India won that inaugural WC in 2007, but has not performed well later. They have been dipping consistently …. Sunil Gavaskar seethed with rage at ECB reject Duncan Fletcher …. Ex-players are out to lynch the non-performing but highly paid Coach. India's record during Fletcher's term has been uninspiring. Starting with the wretched tour of England in 2011, India have lost ten of their 12 overseas Tests and drawn the other two. Gavaskar argues that under Fletcher, there is no improvement as a team and players have also not improved individually. There are some more interesting angles that we perhaps have not seen ….reading a couple of reports in The new Indian Express. It states that Shahid Afridi has played the most no. of T20 Internationals and 4 of the Pakis figure in the top 10…. In contrast, the 25th entry is the Indian - Mahendra Singh Dhoni. To interpret the observation blindly, India haven’t quite embraced the format. But think again. Analyse their respective non-international T20 numbers. Dhoni has figured in 22 more matches than Afridi. The reason, too, is merely stating the obvious. Afridi and his fellow Pakistanis are castaways in the great Indian (money-spinning) Premier League, while Dhoni and his country have fully indulged in it. Of the India skipper’s 163 T20 matches, 96 have been in the bright-yellows of the Super Kings. This clearly explains the dynamics of the shortest format —wherein the ultra-glamorous and the incredibly lucrative IPL and such-like leagues have obscured the relevance of T20 Internationals. It is either reckoned a warming-up prologue to a more meaningful series or a mere epilogue that is forced upon a writer. Even the pinnacle of it, the World Cup, seems like a mere sideshow, a two-year formality than a festival. Indians have played only five T20 Internationals since the 2012 World Cup. Worse still, in the last 15 months, they have played just one. Dhoni is not bothered and went on record stating ‘We have got the IPL where we have played with the best players and the standard there is as high as international standards, so that really amounts to the experience we need’. Seven years since its inception, the T20 World Cup is still evolving; Indians are not…. More than Fletcher, India's bowling coach Joe Dawes has been under-fire for quite sometime as his 'out of the box' coaching methods are simply not working and there was a distinct lack of energy evident among the Indian players ahead of their opening warm-up tie against Sri Lanka tomorrow. Express reports that none of the Indian bowlers practiced against the giant seven feet mannequin that was positioned on one of the centre strips at Khan Saheb Osmani Stadium specifically for the faster bowlers. The red and black coloured mannequin resembled exactly Ajay Jadeja's stance with a slight backlift when the bowler is on delivery stride. Reportedly, the mannequin made with soft rubber has been imported from Australia (interestingly Dawes' homeland). The idea about using it during training sessions is to help the fast bowlers practise separately on a specific area, such as bowling a bouncer or a yorker or even sticking to a channel outside the off-stump. During the two and half hour training session, not even for once did the quartet of Bhuvneshwar Kumar, Varun Aaron, Mohammed Shami and Mohit Sharma seemed interested in bowling against the mannequin. The four-man Indian pace attack were more keen on bowling to the batsman at the two adjacent nets at the far end of the ground. While bowling yorkers aiming at toes of the mannequin can be a good exercise, no one cared to explain what a bowler would do if the batsman uses his feet to alter the length. The height of the mannequin being seven feet, a well directed bouncer aimed at it would actually go over a real batsman's head. In soccer, teams used to have these artificial human walls for set-piece movements and direct free-kicks. But increasingly, top soccer coaches of leading clubs have decreased that trend. Over there at Bangladesh, one saw the mannequin lying on the ground as some of the batsmen wanted to take throwdowns and hit sixes. Just as it was brought to the ground, it was taken away without being used. 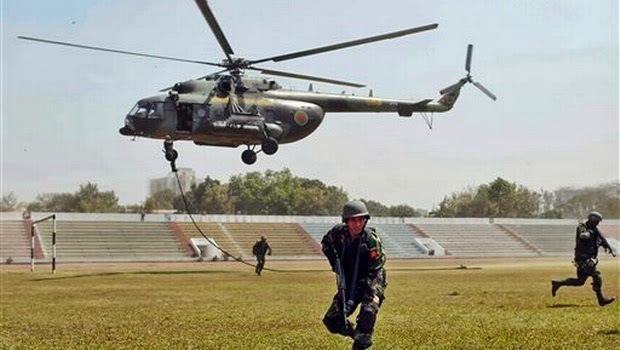 In India politicians are desirous of blackcat commandoes; bullet-proof cars as a status symbol ….. and in Cricket, you have Coaches, who don’t speak and who use mannequin and out-of-box ideas….. this mock is different, it is an exercise by Bangla military ! !